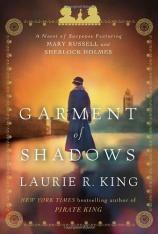 Garment of Shadows (2012) is the 12th novel of suspense featuring Mary Russell, aka Mrs Sherlock Holmes. As with most of these novels, the actions takes place immediately after the previous novel (the exception was the short story Beekeeping for Beginners, which is the first novel The Beekeeper’s Apprentice story from the perspective of Sherlock Holmes). Mary continues to write her memoirs looking back on her life with Holmes. She is a fascinating character, his intellectual equal and charming partner. Holmes recognised her talents and her character and encourages her personal growth. They truly complete each other and provide wonderful witty repartee. Laurie King does an extraordinary job of giving us these two characters, with wonderful atmospheric prose, superbly researched historical and geographical detail and a fast paced story. The opening scene in Morocco has Mary trying to solve the mystery of who she is, having awoken with blood and bandages, amnesia and a sense of impending doom. Meanwhile Holmes begins the hunt for her while also uncovering a larger threat of war between France, Spain and the Rif Rebellion (1920s)(with British allies). We meet again the brothers Ali and Mahmond Hazrs (from O Jerusalem and Justice Hall) in a superbly written, intense mystery. The continued development of so many characters that the reader cares about coupled with the political intrigue at an exotic location creates another wonderful installment in this series. The personal relationship revealed is also acute; they both realise what life might be like without the other. The beloved relationship has subtle clues and wonderful turns of phrase. I loved the scene when Holmes finds Mary but she doesn’t know who he is. I also drank a lot of mint tea and submerged myself in the warm atmosphere of this book. This entry was posted in Book Reviews, Mysteries, Reviews by Helen McIver and tagged Book Reviews, Books, Garment of Shadows, Laurie King, Mary Russell, Mysteries, Sherlock Holmes.